« Can I Please Have a Napkin? 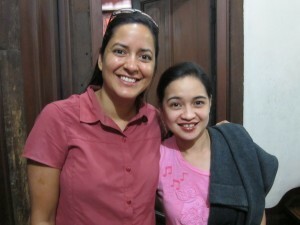 One of my best friends from boarding school in England is from The Philippines and lives in Baguio City. Amy-Gay, or Amz for short, moved back here to go to school soon after leaving the Ursuline Convent, where we went to school. She left Ursuline in 1993 and I haven’t seen her since then. I wouldn’t have guessed I’d come to the Philippines to pop in on her but here we are! Amz and I kept in regular contact for a few years but lost touch after a while. 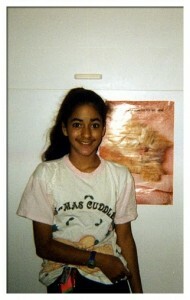 Thanks to Facebook, I’m back in contact with many boarding school friends that live all over the world, including Amz. Gotta love The Facebook. She was an amazing host and toured us around Baguio last week, the summer getaway for Manila dwellers who want to escape the sweltering city heat for the cool mountain air and pine trees. She gave us a sampling tour of great Filipino meals and marienda (snacks). But mostly, I got to spend quality time with a long lost friend. She told Josh about our mischievous school days. And we met her family, saw the house she’s building with her husband and the watercress and small fish farm her Dad tends for “his eyes only”. It was an amazing few days of catching up. Seeing Amz has really made this trip to the Philippines extra special. How wonderful! Made me think of some of my school day buddies. I LOVE this adventure!! Sasha that must have been really wonderful to see Amz again after all those years,I do remember her she looks the same.